The lucky folks at BGR managed to get the images of the still-unannounced HTC Holiday Android phone and have published the spied pictures for the world to see. According to the previous report, HTC Holiday will come with a 4.5-inch touchscreen with a 1.2GHz dual-core CPU, 8MP camera, Sense 3.0 UI and compatible with AT&T 4G LTE network. We were also shown the results of LTE speed tests taken on the HTC Holiday in the Dallas/Fort Worth area of Texas, and from what we saw, they topped out at an incomprehensible 29Mbps — far faster than the fastest speeds we have seen on Verizon’s 4G LTE network. For more information and photo gallery you should head over to BGR. 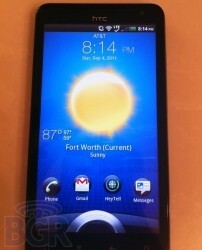 0 comments on "HTC Holiday Android phone pictures spotted"